So for two weeks, I'm away from the festering, burning pit of hell that is the Sacramento Sprawl. This weekend I'm attending/putting on a bachelor party for a good friend up in the wilds of Oregon. Before and after that, I am residing with my parents for a while, enjoying the company of my family and the "charms" that my hometown has to offer. At the end of this all, my better half and I shall go on a short road trip to celebrate the third anniversary of togetherness. Nothing too remarkable... However, this vacation has already proven to be far more, uh, "exciting" than I had anticipated. Aside from the idiot lookie-loos, "law enforcement" was out in full (and misused) force. I was turned back from my attempts to reach my parents' house. Officer Jackass wouldn't even listen to me long enough for me to explain my situation (yes, I don't live there, but I am currently staying there, I have possesions there, and my dad has a bad back and can't lift too much, so he needs me to help load out...), "resolutely" turning me away. So I parked my car and walked up. I met no resistance, which I find odd, as if the police were really looking out for my safety, couldn't I flee faster by automobile than by foot? Regardless, I regret that the pig's heavy-handed manor infuriated me so quickly and so thoroughly (as such jackass, authoritarian manners always do) that I was unable to communicate effectively to the fellow, and was, quite actually, ready to go to jail for whatever charges he would level against me for whatever I might do in my infuriated state. 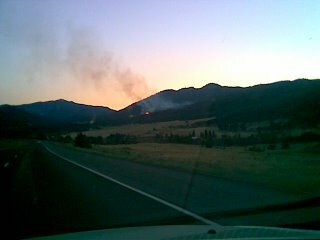 Regardless, the fire was under controll within an hour of my arrival at my parents' place. Looming evacuation orders were rescinded, the embers died down, and the fire trucks drove away, as did an utter horde of troglodyte lookie-loos who had managed to make it up the hill before the police started blocking the way. I'm glad to know that the police felt it was more important to keep me away from my kin, property, and memories, than to turn back that horde of jackasses. 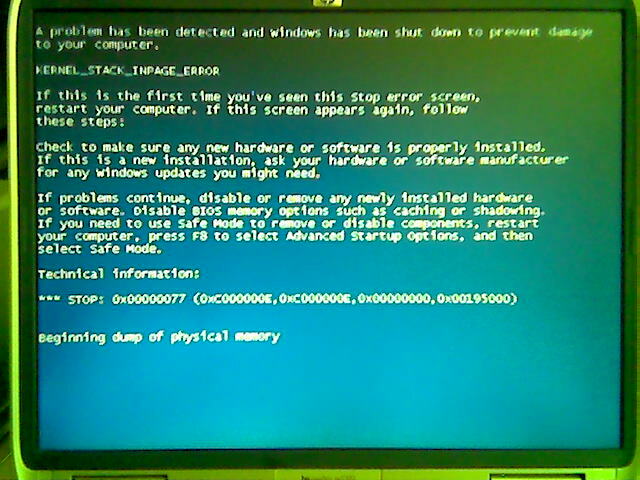 The most lamentable part of the ordeal is that I never quite got to live the lifestyle that I wanted the laptop for. I never got to write a novel on it while sitting in the corner of a pub, nursing a pint, occasionally nibbling on some Welsh rarebit. The most I ever did with it that was dependant on it being a laptop was surf the internet from my couch and work on a paper for one of my education classes while riding down I-5 in the passenger seat of a car. Now it's time to shop for a new computer, but this time I think it'll be a desktop - money's not tight, but it'd still be an extravagance to buy a laptop at this point in time. 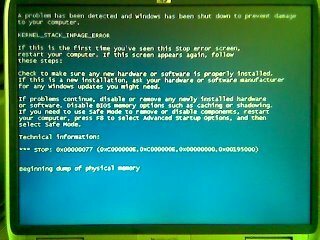 And worse comes to worst, there's still my work laptop. Now anyone have any desktop suggestions for someone who's a compulsive internet surfer, downloader, and occasional writer? Place the salmon fillet (1lb or so, and don't use a center-cut "steak" - the grain will be wrong for what we're trying to do) on a big ol' sheet of plastic wrap. Completely cover the salmon - on all sides - with the entirety of the salt/sugar/spice mixture. Wrap the whole thing up tightly in the plastic wrap, then give two or so more coats of plastic wrap. Then place inside two big zip-lock bags. Basically, you want this thing hermetically sealed, 'cause it's gonna get juicy as the salt draws the liquid out of the salmon... Then place the whole mess in a casserole-type dish to catch any escaping juices. Then put some sort of weight on the salmon - whether or not you actually need to do this, I don't know, but it is part of the hoo-doo of lox-making lore, and I did it and it seemed to work well... I used a tupperware container with a base about the size of the salmon fillet, and placed a big can of baked beans in the container. Then, place this whole mess in your fridge and wait. I took mine out and flipped the salmon every 12 hours or so - again, I don't know if that's really necessary, and I don't see why it should be, but it is part of the hoo-doo. The range of time to "cure" the salmon varies between recepies - some say 3 days, some say a week. I went for a week, and while it's good, I think I'll go for around 4 days next time to keep things a little less salty. 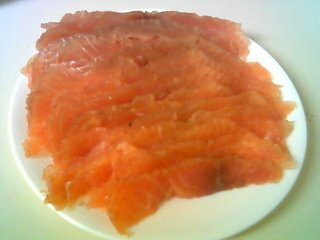 What I pulled out of the wrapping was much firmer than the un-cured salmon fillet. I then rinsed all the remaining brine mixture and spices off of the now-cured salmon with some cold water, patted the whole thing dry, and then I set about slicing it up. With a not-so sharp knife I was able to, surprisingly, slice near paper-thin slices from the firmed-up fillet. The resulting lox slices are translucent, bright orange, glistening, and otherwise feel and look every bit like all the lox I've ever bought commercially. Taste-wise, things are very similar - mine is a bit saltier, which I don't object to but will attempt to correct in the future, and the inclusion of coriander makes for a noticably different, but IMO entirely welcome, floral/hot spice element. I think I shall never buy commercial lox again. Unless, of course, it comes with a bagel and cream cheese attached.